In an interview with 702 recently, Cyril Ramaphosa remarked that the lackadaisical attitude among white South Africans, particularly those with power toward the plight of Black South Africans, was cause for anger. The post Steve Hofmeyr and right-wing South Africans changed Twitter handles to ‘lackadaisical’ after Ramaphosa’s comment appeared first on The South African. There’s more than a grain of truth to this, and as white South Africans at some point we need to take stock of what we’ve given up for this reconciliation Madiba spoke of and what has changed for the average South African on the street. Ultimately, the government and ruling party have much to answer for in terms of delivering services and justice to the marginalised. However, as members of society with political, social or economic power we must also be aware that we cannot return to the well too often before we leave our less fortunate neighbours so distraught with their situation that the basis of the society we enjoy will be at risk. 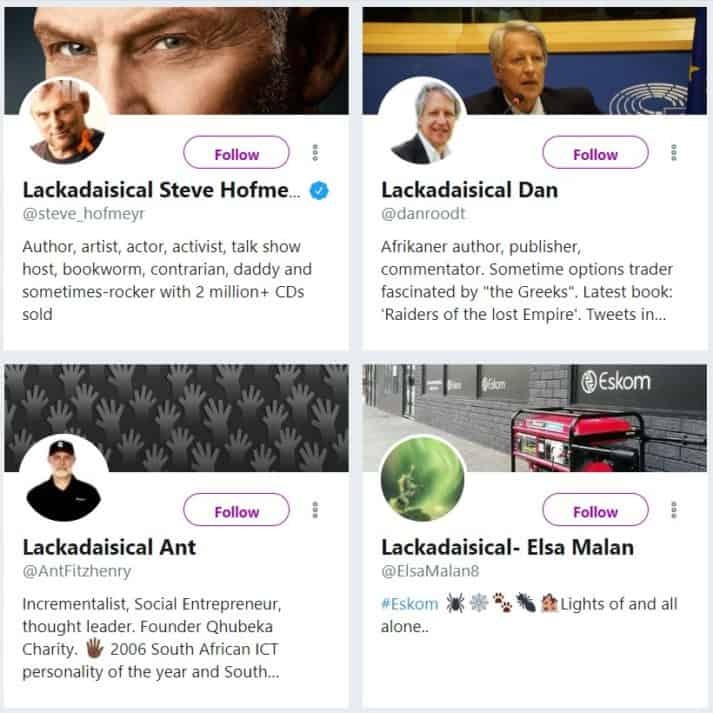 With this in mind, I’ll point out that Steve Hofmeyr has changed his Twitter handle to include the word lackadaisical. To own the title, I assume. Sorry though, Steve and your right-wing cronies, the lackadaisical comment wasn’t aimed at you. Lackadaisical is a term meant to describe a lack of determination. Laziness, if you will. Mr Hofmeyr and his ilk are nothing if not determined. Determined to retain every bit of privilege they’ve gained at all costs. So move along folks, there’s nothing to see here. All we really have are a bunch of right-wing folk copying the right-wing folk who took issue with being called deplorable that one time. It’s not accurate, and it’s not original. The president wasn’t talking about you but enjoy the free press. “Let them eat cake” has become a mocking rebuke of the detached upper classes but it’s not a far cry from describing the extreme disconnect many South Africans have with what it means to be the average South African. In South Africa, income inequality is split fairly consistently across racial lines. According to StatsSA, the majority of South African households live on an average of about R70,000 a year. These households are predominantly Black households, they are the households of the cheap labour that enable the lifestyles many of us enjoy. 46% of South Africans bring home less than R1,000 a month. The bottom 10% of South Africans have to live off R345 a month. Around 81% have to live off a monthly budget of R4,000 per person or less. If you have a monthly salary of R7,300, you are in the top 10% of SA earners. Two-thirds of South Africans manage off less than R 1 800 per month. Looking at these realities, lackadaisical is probably not the worst thing we can say about groups who are so concerned with their own well-being they don’t even acknowledge their privilege, and pretend the South Africa they see every day is the only part of South Africa they have a responsibility to.